Connnietang: What's In My Handbag? Whats in my bag? Almost everything. I'm one to carry around a super heavy purse in exchange for knowing that I have almost anything I can ever need. Hair tie? Check. Floss? Check. Snack? Check. External battery? Check. And I can go on and on... Sometimes I feel like my purse is like Hermione's in Harry Potter, where she was able to carry everything they needed while hunting for Horcruxes! Life is stressful enough with unexpected hiccups, and I always try to find creative ways to stay positive, upbeat, and prepared about anything. Stress isn't always a bad thing, I personally like to channel it into motivation. Kick stress to the curb and allow it to help push and encourage yourself to achieve more, and honestly you might be surprised by the outcome! I'd like to share a recent stressful event with my baby dog, Mochi. (He actually isn't a baby, but is one in my heart!) He recently started to have seizures, the first one lasted only a few minutes, but a few months later he had 4 seizures in one night. It goes without saying that I that was a stressful night trying to calm him down and driving him to the vet in the middle of the night. Fortunately, he is doing better and is on anti-seizure medicine now which helps control his seizures. This was an eyeopener to me that I should live a healthier lifestyle personally and with him. Now I watch what I eat and have been learning how to play tennis with the other half. We also take him out more often for longer walks, jogs, and around with me on the weekends. 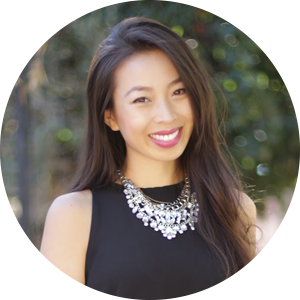 I recently got introduced to RESCUE and their products that help you stress less, stay calm, and in control in a natural and safe way! (It is non-habit-forming) RESCUE is developed by a doctor and has been used and trusted by millions worldwide. I'm trying out RESCUE Pastilles which are these yummy little candies and would like to invite you to try them out with this BOGO RESCUE coupon! 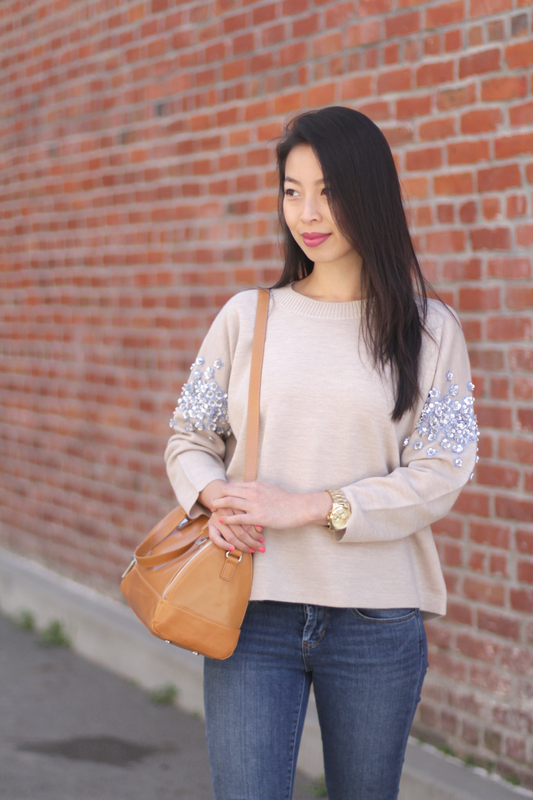 Top: Sequin Floral Sweater from J.Crew. Steal: Denzel High Low Knit Sweater in Taupe from Dailylook. 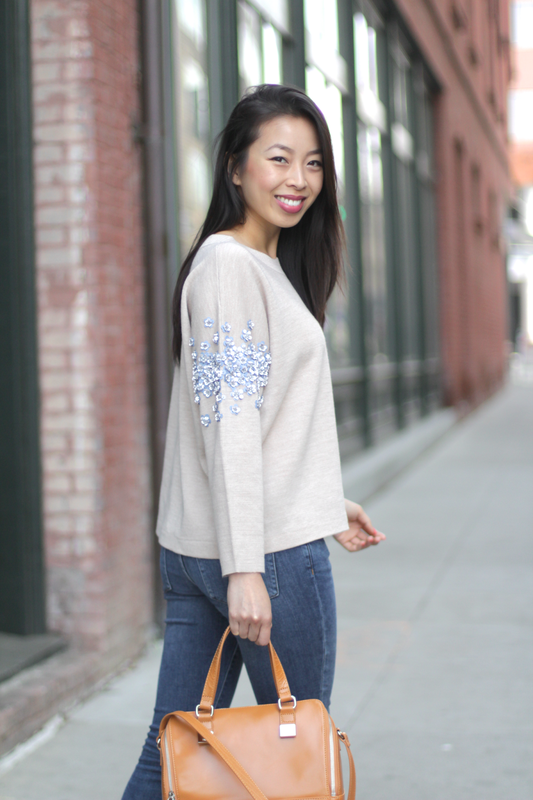 Splurge: Sequin Floral Sweater from J.Crew. Jeans: Articles of Society 'Sarah' Skinny Jeans. Steal: Articles of Society 'Sarah' Skinny Jeans from Nordstrom. Splurge: Rag & Bone/JEAN The Frayed Skinny Jeans from SHOPBOP. Watch: Michael Kors 'Runway' Chronograph Watch, 39mm from Nordstrom. Steal: Metallic Chronograph Watch from Forever 21. Splurge: Michael Kors 'Runway' Chronograph Watch, 39mm from Nordstrom. Bag: Isabel Handbag thanks to Hobo Bags. 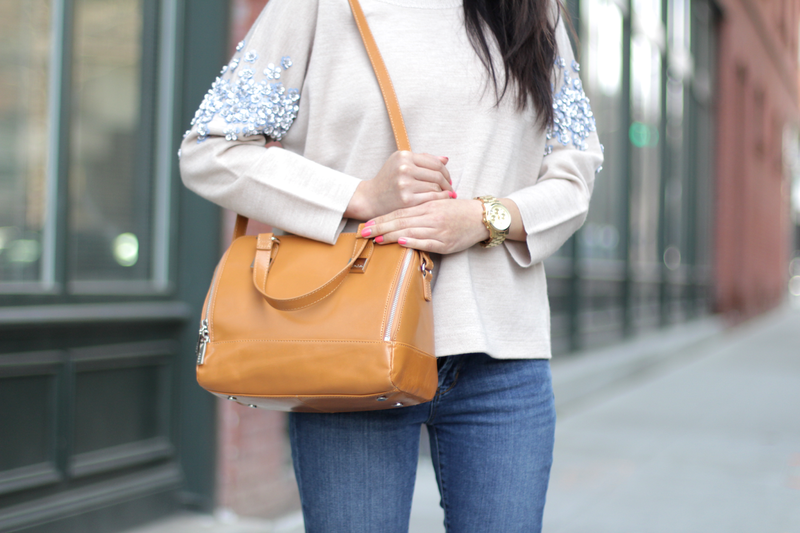 Steal: Isabel Handbag thanks to Hobo Bags. 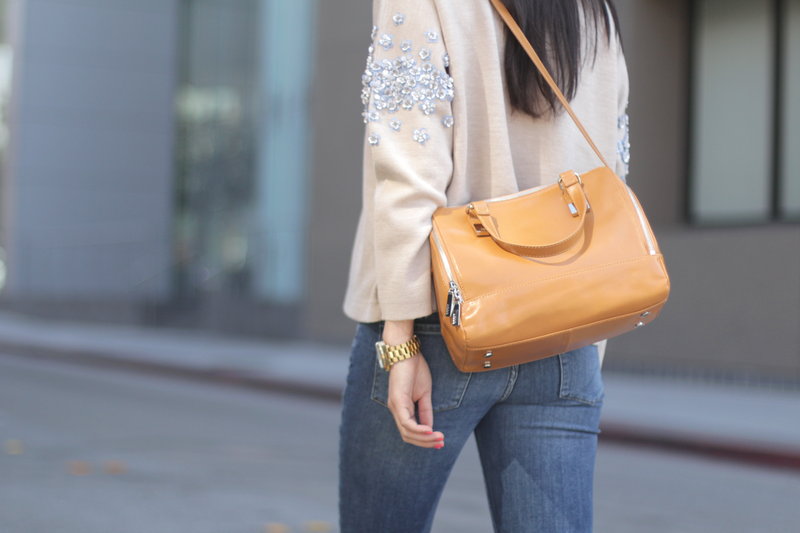 Splurge: MICHAEL Michael kors Cindy Large Done Satchel in Peanut from Zappos. Shoes: Kristin Cavallari Laurel Grey Suede Peep Toe Bootie thanks to Chinese Laundry. Steal: Kristin Cavallari 'Laurel' Grey Suede Peep Toe Bootie from Chinese Laundry. Splurge: Dolce Vita 'Leka' Open Toe Bootie from Nordstrom.